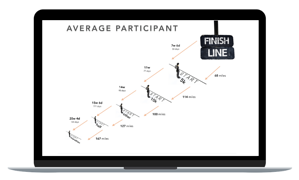 Last week we hosted the third webinar in the imATHLETE / Running USA Data Insight Series. In this episode we looked at registration trends for local participants and travelers, revealing when people register for an event given their proximity to the event and how those patterns compare across event distances (5k, 10k, etc). Yes, it really is an episode - complete with characters (the 5k'er, the marathoner) and "plots" that unfold from the story that the athlete data and behaviors are telling us. Using our pool of 122m+ data points on athletic consumerism and 489,000+ responses from an ongoing athlete survey, we noted important trends that directly influence the marketing decisions of all race organizers. After analyzing over 1.2m registrations from over 3,500 events, we identified trends of earlier registrations and greater travel for 5k and 10k events, some of which is related to the increase in multi-event challenges. Meanwhile, participant travel for half marathons and marathons remained fairly consistent since 2016. The longer the race distance, the more linear is the increase in registrations over time. With shorter events, we see a more dramatic uptick toward race day. We identified times in which participants are most likely to register based on their distance from the event location, which can be used to maximize geographically-targeted marketing efforts. The takeaways can change the way all event organizers run their businesses. We are happy to do the analytical heavy lifting on our aggregate data. Our goal with the series is to share the knowledge to elevate the success of event organizers. We want to further strengthen the industry. Intrigued? Then don't miss the 4th episode of the Data Insight Series, on Wednesday, November 7th. Register now to attend. Apropos of the approaching holiday season, Data Insight Series #4 will focus on the use of discount codes and best practices around discounts. We will be posting excerpts from each of the sessions. If you'd like to rewatch any of the archived Data Insight Series webinars, they can be found in the collection of Webinars available to Running USA members at www.runningusa.org. Data Insight Series Part 4 - Discount Codes and What you're doing wrong - coming Nov. 7!